In the previous post we manage to pass pixel data from one clock domain to another and getting it displayed it on a VGA screen. The above was a very nice practical test for me around all the theory surrounding cross clock domains. I must admit, I was quite overwhelmed with all the theory surrounding Cross Clock Domains on the Internet. The next big goal is to attempt to read frames from SDRAM and display it on a VGA screen. This is quite a big chunk to perform at once, so we will try and break it down in small chunks. In this post we will try and see if we can attempt to read from SDRAM to FPGA. We have already managed to write to SDRAM in a previous post, so the reading shouldn't be that hard. However, the only part that concerns me with the reading is that our pixel clock clock is operating at speed very close to our AXI clock speed, so we must validate if our AXI system can keep up with with sufficient performance. So, in this post I will also show a very primitive way for checking AXI-bus performance. Throughout this whole Blog-series I have been following the approach of divide and conquer. This just makes life simpler when exploring new turf and should you encounter a bug you limit the scope you need to search in order to isolate the problem. This is also the reason why we are only going to focus in this post in reading from SDRAM to FPGA. But, in order to validate that we are reading data correctly from SDRAM, we need to be able to populate SDRAM with known data in the first place. So, what is an easy way to populate SDRAM with known data? The Xilinx SDK come to our rescue here. 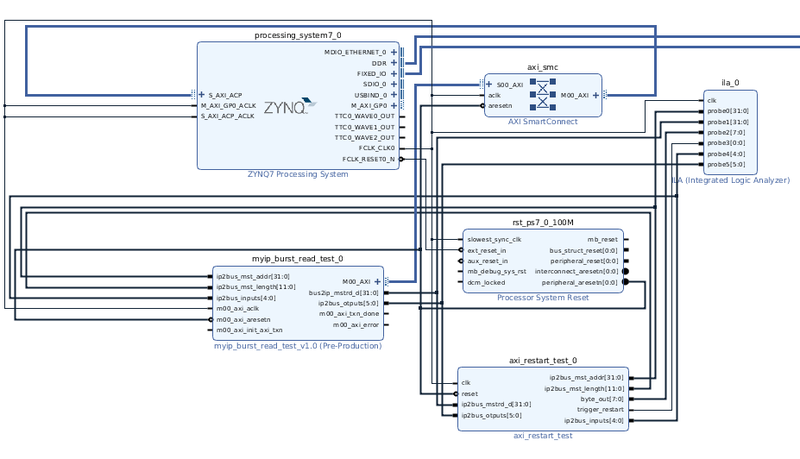 The XCST console integrated within the Xilinx SDK actually allows you to write a binary file that is present on your desktop machine directly to SDRAM on the Zybo Board at an address you specify. Since our main goal is to develop a C64 on FPGA I am going to use the XSCT console to write a copy of the BASIC ROM from the C64 to the SDRAM of the Zybo board. We are then going to attempt to read this binary back from SDRAM to our FPGA by means of our developed design and inspect the data that comes back by means of an Integrated Logic Analyser. I have covered the use of an Integrated Logic Analyser in a previous post. To make things more interesting we will take the data received from SDRAM, which is in 32-bit word form, and output it to a 8-bit port in a byte by byte fashion, Reliving the 8-bit area! To make our development a bit faster, we will be reusing our code developed in a previous post where we managed to write to SDRAM. With some tinkering we can make it read from SDRAM. Let us refresh our minds again on how this code worked. 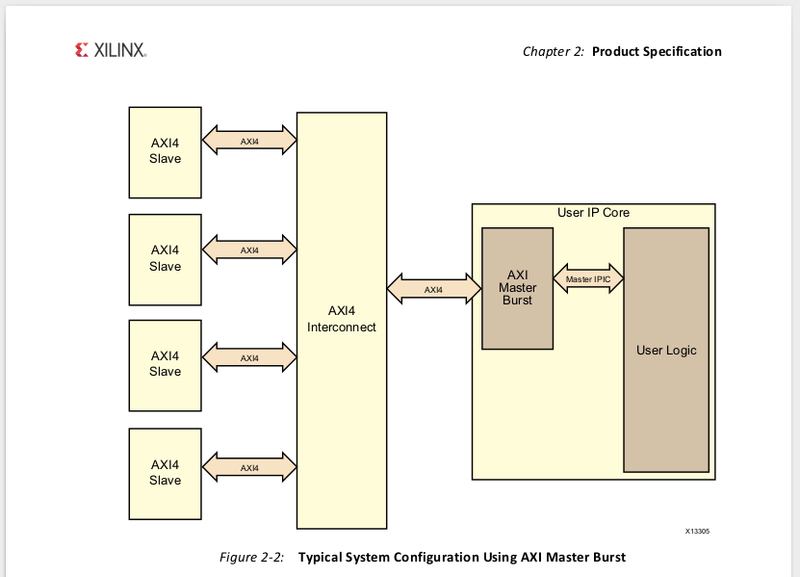 The relevent IP Core I have just described is indicated by the block AXI Master Burst. This block connects to the outside world via AXI. Our user logic will connect to this block via the IPIC protocol which is somewhat simpler than the AXI protocol. Now, we need to wrap the AXI Master Block within an IP within Vivado so we can add it as a block within our Block Design. We will then wire up the rest of our design to this Block. 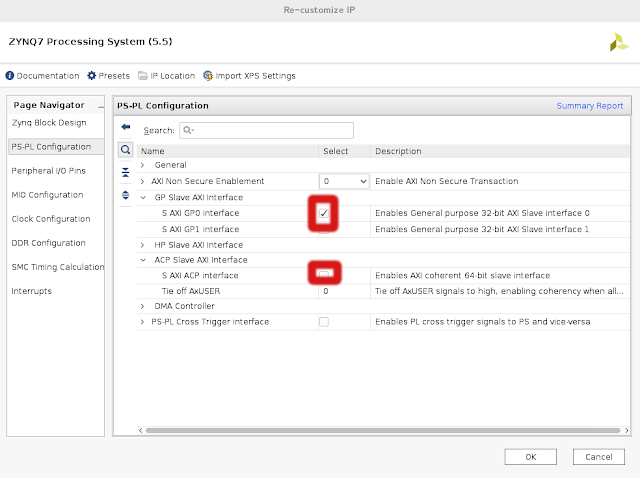 All the port which names starts with ip2, forms part of the IPIC which is connected to the AXI MASTER Block. During the course of this post we will rework both the module burst block and our AXI IP to cater for SDRAM reading. I want to stress though that I will however not change these two components to provide dual functionality, but rather make copies and change the copies to provide the read functionality. Thus, in the end we will have a AXI IP and burst_block providing the AXI write functionality and we will have another AXI IP and burst_block-set providing the read functionality. Let us start by creating a new AXI IP Block for reading. As mentioned in a previous post, you will start off this process by clicking on the Tools menu, selecting Create and Package new IP, and selecting Create AXI Peripheral on the second wizard page. This block almost looks the same as the one we have develop for writing to SDRAM. The real major difference is that we don't have a data input port, but a data output port. In our Write Axi block from a previous post we swapped around the zero and one values. Because this block is a read block, we are interested in Coherent reads rather than writes. ACP coherent read requests: An ACP read request is coherent when ARUSER = 1 and ARCACHE = 1 alongside ARVALID. In this case, the SCU enforces coherency. When the data is present in one of the Cortex-A9 processors, the data is read directly from the relevant processor and returned to the ACP port. When the data is not present in any of the Cortex-A9 processors, the read request is issued on one of the SCU AXI master ports, along with all its AXI parameters, with the exception of the locked attribute. ACP coherent write requests: An ACP write request is coherent when AWUSER = 1 and AWCACHE =1 alongside AWVALID. In this case, the SCU enforces coherency. When the data is present in one of the Cortex-A9 processors, the data is first cleaned and invalidated from the relevant CPU. When the data is not present in any of the Cortex-A9 processors, or when it has been cleaned and invalidated, the write request is issued on one of the SCU AXI master ports, along with all corresponding AXI parameters with the exception of the locked attribute. Why do we need to look at memory in the same way as a CPU core? The answer is that because we will be using XSCT console to write test data to SDRAM for reading back later by our user logic. The XSCT console, however, always operates within the context of a CPU core. So reads/writes that we do from this console will always be from a L1 or a L2 cache. So, if we make use a AXI master port accessing the DDR RAM directly, like HP AXI or GP AXI, we might not read the data back that we wrote via the XSCT console. A major change compared to the previous AXI write module is that our module will now be receiving data from the AXI port and the rest of our design will now read data from this block. The read port will now be driven user logic instead of the AXI port. However, the write port will now be controlled by the AXI port via master_read_src_rdy. It should be noted that source and destination is different within a AXI read context. Within a AXI read context, the source is SDRAM and the destination is our user logic. Apart from the master_read_src_rdy signal, bytes_to_received is also used to indicate that a write should happen to the FIFO buffer. We initialise this register when our state machine is in the START status. Our state machine uses the same states as with our AXI write mechanism, with some minor changes to the conditions for transitioning to other states, but more on this in a moment. You might have noticed we are referencing a port called restart. I am using this port to cater for the scenario where we are constantly reading frames from SDRAM. When we have finished reading a frame from SDRAM, we would like to reset the memory pointer to the beginning of the frame. The restart signal also needs to be used by state machine, which I haven't shown above, since it nees special mention. 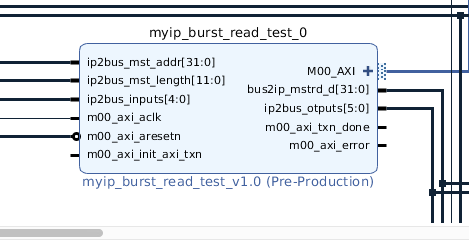 With our new AXI IP and burst_block_read module developed, it is time we give it a test run. As mentioned earlier, our test will be to write the BASIC ROM to SDRAM via the XSCT console and then see if our FPGA reads back the same information. This module takes the words received from the burst_read_block and it returns it byte for byte over the output port byte_out. 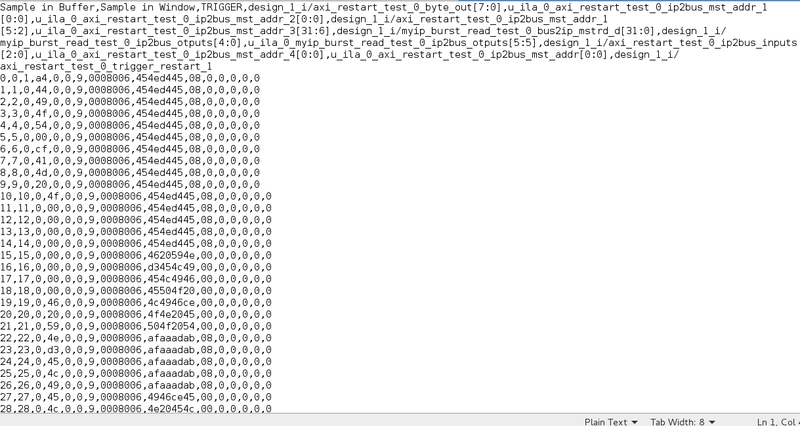 It also continuously outputs the first 1024 bytes of BASIC ROM which is retrieved from SDRAM. Let us have a look at the Test Results. Probably the easiest way is just to view the captured waveforms in the Waveform window. We have, however, also the option to view the captured data as a csv file, which we will use in this post. You need to specify the full path for the resulting zip file. Also, hw_ila_1 is the name of your wave capture window. You will see that some fields, like ip2bus_mst_addr, is broken down into two fields for some reason. Now, let us see if we can analyse the data! I have highlighted in Bold Black the end of the restart pulse. I have indicated changes to other signals in red. Let us see if we can puzzle out what the signal changes in red represent. First, let us have a look at the signal which change from a 4 to a 3. So, we can see that in transitioning from 4 to 3, we are signaling that we are ready to receive data and we issue a read request. So we see that Bit 0 transitions to 1 indicating the the AXI subsystem has indeed accepted our command! What is funny, though, is that the two entries following the transition indicates that source ready signal is not asserted straightaway! This means that we don't have data available yet from our AXI system that we can read. I had a look at a couple of subsequent read requests and all of them have this delay of more less 37 clock cycles. So, we can conlcude that for each AXI read request, there is a 37 clock cycle latency. 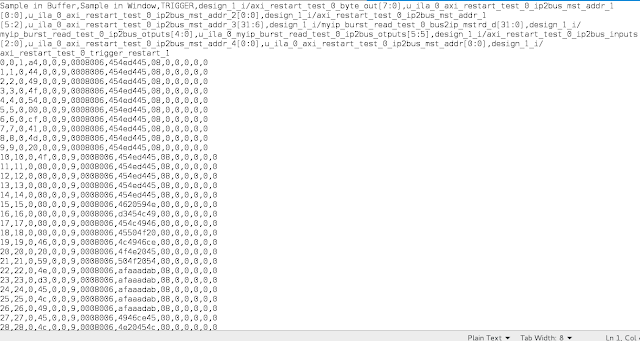 This looks more or less like the data at the beginning of a C64 BASIC ROM, with the byte order reversed, though. The byte values looks more or less ok, except that just after the 64th byte we are presented with 8 zero byte values, which is not correct if you compare with the actual BASIC ROM data. This is basically a snippet of the CSV file converted into an HTML table. I have also added an extra column on the left hand site and a column on the right hand side. The column on the left hand site indicates when our byte output stream starts, and increment the count after each byte output. For byte count 64 and up the count cell is blank and indicates invalid data. The extra column on the righthand site counts each time we receive a four-byte word from the AXI bus. You can see that received word number 15 is the last word of data that arrives "in-time"and gets displayed during byte number 60, 61, 62 and 63. We can avoid this buffer underflow situation by tweaking the size of our FIFO receive buffer. The size of the buffer should be made just over twice the BURST_THRES paramater. Which value of BURST_THRES should we choose? BURST_THRES should be set so that we trigger the next AXI read transaction with enough elements in our FIFO buffer to survive the latency of more or less 36 clock cycles. So, to cater for a possible worst case scenario, we can probably choose a BURST_THRES of 50. So a typical FIFO buffer size for this scenario would 102 elements. Just a final note on analysing the data in the CSV file. Another kind of odd behaviour you might realise from the HTML table above is that once we start receiving the data words from the AXI subsystem, we receive it continuously from Word 0 to Word 7. However, after Word 7 there is a delay of four clock cycles before we receive data again. You get this kind of behaviour for the other AXI read transactions as well, but for the majority of cases it is not only 4 delay cycles, but 6, 7 or 8 delay cycles! Considering that we are requesting 16 data words at a time, these delay clock cycles eats more or less 50% of the available bandwidth! Let us see if we can figure out why our bandwidth is so low. After some reading I found a clue. The ACP-AXI port we are using is 64-bit wide on the Processing system side. Our AXI IP block, however, has a 32-bit wide data port instead of a 64-bit one. I suspect that this 32-bit wide data port is the cause for our bandwidth issue. The obvious check then be to extend the databus of our existing AXI IP also to 64-bit. However, quickly looking at Vivado it doesn't seem so obvious to extend the databus width of a AXI created peripheral to 64 bits. There is an option to specify databus width from the dropdown, but in the drop-down, suprise-suprise, there is only a 32-bit option! I am sure with some tweaking one could make a 64-bit option appear, but for now I want something simple to test my theory on whether the mismatch of port width is the cause for the bandwidth issue. Another option would be to use an AXI port on the Processing subsystem that is also 32-bits wide. At least then we test if matching ports also result in the same amount of lost clock cycles. There is indeed an AXI port on the Processing subsystem that is 32-bits in width: The General Purpose (GP) AXI port. To be honest, I have have been avoiding AXI-GP ports up to this point in time for the simple reason that it is not guaranteed that the FPGA will see test data we wrote via the XSCT console on an AXI-GP port. SO, let us see if we can move the bar higher and see if we can make the FPGA read data on the AXI-GP port written by the XSCT console. To do this, let us have a look again at the question: Why can't we guarantee that memory writes via the XSCT console will be read back via the FPGA on the AXI-GP port? The answer to this question is that memory writes via the XSCT console doesn't get written directly to DDR memory, but rather to the L1 cache associated with the ARM Core our XSCT console is attached to. So, is there a way to flush the contents of the L1 cache to DDR memory? To answer this question, we need to look a bit in the ZYNQ Technical Reference manual on how the whole L1-Cache mechanism works. The L1-Cache contains a number of Cache lines. When a request is made from Main Memory, the contents is read from DDR memory and then stored within a Cache Line. All subsequent requests to the same memory location is retrieved from the relevant Cache line within the L1-Cache. With writes to main memory the relevant contents is first read from Main memory and stored within a cache line. The contents to be written is then applied to the relevant cache line, and the whole cache line is marked as dirty. If we just left it there, we will just have a Cache line entry marked as dirty, which will never be written to Main Memory. However, things start to change when we keep writing data up to a point when we have no free Cache Line entries left. In this scenario the L1 Cache Manager will choose a Cache Line entry to evacuate to accommodate the new write. The Cache Line entry chosen will usually be a Least Recently Read/Wite one. If the chosen Cache Line is marked as dirty, the existing contents first gets written to main memory. So, to ensure that our writes from XSCT console gets written to Main Memory we need to write a file that is bigger than the size of the L1 Cache. The L1 Data Cache is 32KB, while the BASIC ROM we used previously for testing is 8KB in size. So we need to create new file by contenting the BASIC ROM a number of times till the resulting file is bigger than 32KB. The file big.bin will then be the file you use to write to memory via the XSCT console. Let us change the design to make use of an AXI-GP port. We this by double clicking on the Processing Sub System Block within the Block Design. 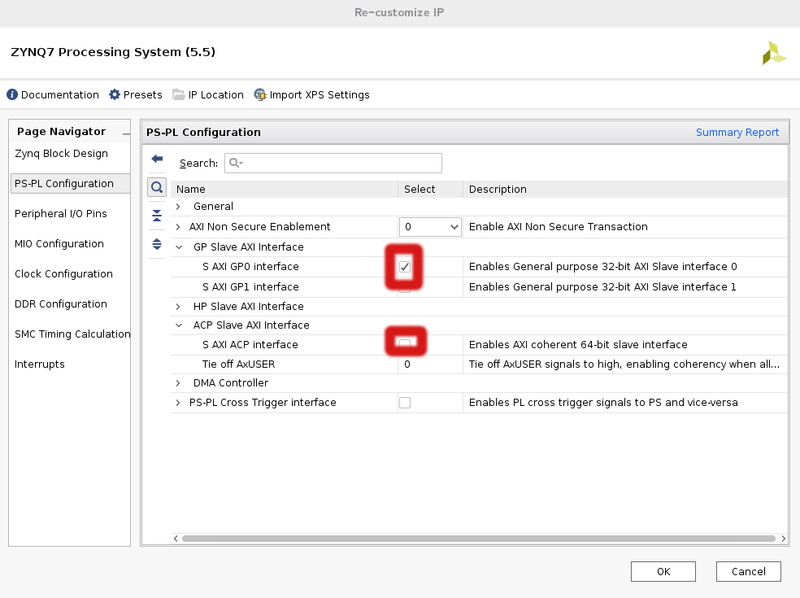 We Unselect the ACP Salve Interface so that only one AXI Slave port is present on the Zynq Processing block. Finally you need to wire everything up again. From these set of results we can see that are coming pretty close to the theoretical bandwidth. In this post we have discovered how to read from SDRAM to FPGA via the AXI port on the Zynq. We also had at the bandwidth performance while reading. Reading data from a AXI-ACP port with a databus width of 32-bits is probably not the cleverest thing to do, and you sacrifice a lot of the potential bandwidth in this way. Our test on a 32-bit AXI_GP behaved more or less as expected and we got close to the theoretical bandwidth. In both tests (e.g AXI_ACP and AXI_GP) we experienced a latency of more less 37 clock cycles per AXI read transaction. Your FIFO buffer should be made large enough so that this latency doesn't effect the Bandwidth. In the next post we will see if we can continuously read a picture fram from SDRAM and display it on the VGA screen.